MaxAim DI (v. 4.00+) enables Direct Input binding to the controller layout, allowing you to use any game controller of your PC through the Direct Input interface. This includes steering wheels, driving wheels, flightsticks, fight sticks, joysticks, etc. Just bind the Direct Input entries to the MaxAim DI controller layout and you are ready to go! • Enabled: Enable/Disable Direct Input. If enabled the commands performed on the game controller will be forwarded to the console. This operation can also be performed through keyboard shortcut (F5). 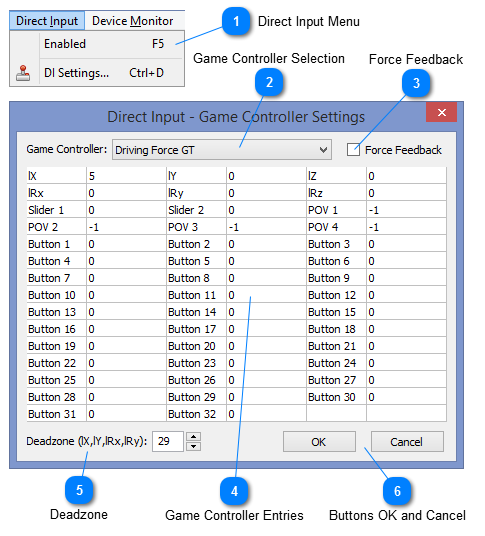 • DI Settings: Open the Direct Input Game Controller settings window. The combo box enumerates all game controllers available in your system, to activate a specific controller click on the combo box and select it. Your last selection will be automatically saved and the controller can be used any time, as far it stays connected to your computer. Enable/Disable the Force Feedback of the DirectInput Controller, if avaliable. All available entries of a Direct Input controller is shown in this panel. Note this is a generic structure and not all entries will be active for your controller. 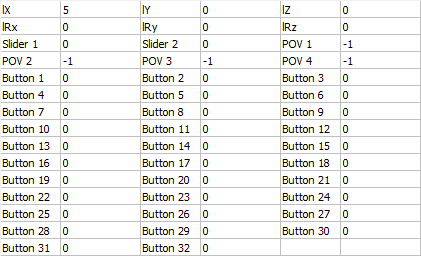 Use this panel to test your game controller and to check the association of a specific controller entry to its label. For example, on Driving Force GT the lX represents the steering wheel, where negative values means "turn left" and positive values "turn right". The lY is used for the pedals, the Button 10 is the Start button and so on. Set the deadzone of the analog sticks. Useful to use the DirectInput controller concurrentelly with the Gamepad connected on the Titan One device. The OK button will save your controller selection and close the window. The Cancel button will close the window without save any changes.